OSLO, NORWAY and STOCKHOLM, SWEDEN--(Marketwire - July 11, 2008) - In time for today's worldwide launch of the 3G iPhone, Mobiletech has released enhanced support for the iPhone. Mobiletech's new iPhone support means that now all of Mobiletech's customers can have iPhone friendly version of their mobile sites which make use of the iPhone's unique user interface and powerful iPhone specific features. Johan Brandt, Director DN Mobile, says, "iPhone invites end users to surf, and has affected our view and demands on mobile internet. Therefore we are optimizing our mobile site to iPhone's screen and functionality, ready for today's launch of the device in the Swedish market." 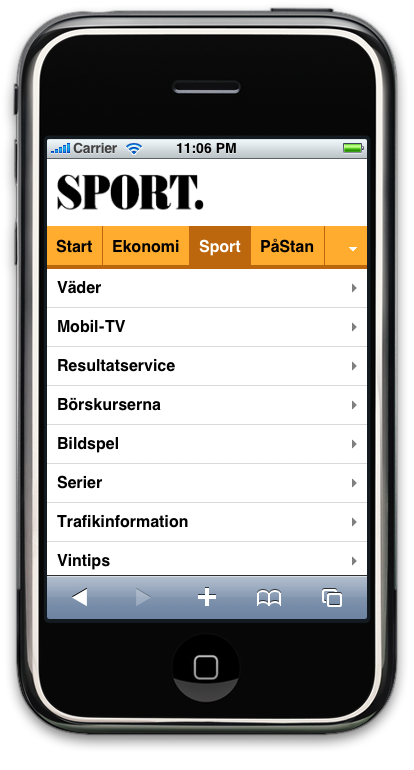 "Dagens Nyheter has been at the forefront of the mobile newspaper revolution. 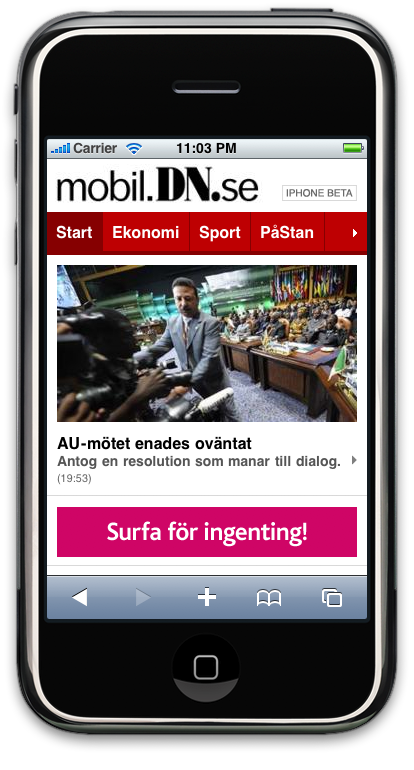 By enabling enhanced iPhone support on their portal, DN will give its mobile readers the best experience on their new iPhone from its launch," says Anders Holen, CEO Mobiletech Sweden. "The iPhone has revolutionized the mobile internet industry with its compelling looks and ease of use. Hence, it is only natural for Mobiletech to build support for iPhone features into Dextella, Mobiletech's service delivery platform," says Espen Askvik, CEO Mobiletech. Mobiletech (www.mobiletech.no) is an independent Norwegian software company that delivers a complete range of products and services to enable rich and engaging communication through mobile devices. Mobiletech was founded in 2005 and is the power behind advanced mobile services for major media companies, operators and other corporations in Scandinavia. Mobiletech has a dedicated team of passionate professionals with skills in mobile web publishing, transaction based services, telecoms, banking and mobile technology. Mobiletech has offices in Norway (Oslo, Bergen and Trondheim), Sweden (Stockholm) and USA (Washington DC). Dagens Nyheter is Sweden's largest morning newspaper with a daily circulation of some 350 000 copies and over one million unique visitors at DN.se. DN is independent; stands free from political parties, organizations and financial interests and work in a liberal and broadminded tradition. The company is a part of the Bonnier Group, one of the leading media houses in Europe.